Summary AC2600 class MU-MIMO router with 60 GHz 802.11ad radio w/ max 4600 Mbps link rate. Has Gigabit Ethernet ports, 10 GbE SFP+ port and USB 3.0 storage and printer sharing. I didn't think I'd be seeing another 802.11ad router for awhile after reviewing TP-Link's Talon AD7200 back in August. But the folks at NETGEAR apparently think there is a market for WiGig routers and pretty expensive ones at that. Hence this review of the latest addition to NETGEAR's Nighthawk line, the R9000 Nighthawk X10 Smart WiFi Router. Like the TP-Link Talon, the R9000 is at its heart a 4x4 AC2600 class MU-MIMO enabled router with a single-stream 60 GHz 802.11ad aka "WiGig" radio along for the ride. Maximum link rate math is 800 Mbps (2.4 GHz) + 1733 Mbps (5 GHz) + 4600 Mbps (60 GHz) = 7133, rounded up to 7200. The R9000 is packed with hardware features obviously meant to appeal primarily to router geeks. After all, how many of your friends and family even know what an SFP+ port is for? But not only does the R9000 have one, it's also 10GbE. If you don't have anything to plug into it and still want more bandwidth than a single Gigabit Ethernet port can provide, NETGEAR has you covered, too. Two of the router's six LAN ports support 802.3ad link aggregation, which will come in handy if you have a smart switch that also supports LACP. On the wireless side, besides the 60 GHz radio and MU-MIMO, the R9000 also supports 160 MHz bandwidth mode in case devices that also support it ever appear. The R9000 is NETGEAR's second router to support 160 MHz bandwidth, with the R7800 being the first. Since there is not actually 160 MHz of contiguous bandwidth in the 5 GHz band available in consumer routers today and since the R9000 does not support DFS channels, this is implemented as 80 MHz + 80 MHz. The NETGEAR R9000's LEDs are annotated in the callout diagram below and include a light for each radio and LAN port. Invidual Ethernet ports have no lights on them either. You get buttons to start a WPS session and turn Wi-Fi on and off are built into the two right-most lights. The rear panel has the single WAN, six switched Gigabit Ethernet LAN ports and one 10 GbE SFP+ port. The two USB 3.0 ports are on the left side near the front. LEDs are apparently a nuisance that must be controlled. Not only is there a rear panel switch to shut them all off (except the Power light), but you can also leave them on, but stop them from blinking via administration settings. The bottom and top of the router have plenty of vent slots. There are no vents on the sides. The R9000 is designed to sit flat on a desk, but can be wall mounted via two bottom-panel screw slots that will orient the rear panel toward the ceiling. It's a pretty heavy sucker, though, so install those screws well if you do wall mount it. NETGEAR has its internal FCC photos under 180 day non-disclosure, so I dove in once testing was completed. The photo below is the view with the top cover removed. Take a guess where the 1.7 GHz quad-core Annapurna Labs Alpine AL314 CPU is. This is the first appearance of an Annapurna Labs processor in a router, but not the first for a quad-core CPU. That was a Qualcomm IPQ4019 in the NETGEAR Orbi. The IPQ4019 is based on ARM Cortex A7; the AL314 is ARM Cortex A15. This is a pretty beefy processor, more typically used in NASes like Synology's DS1515 and QNAP's TS-531P. So NETGEAR's obviously out for bragging rights here (take that Linksys' WRT3200ACM, with your little girly-man Marvell dual-core!) TP-Link's Talon AD7200 also opted for a dual-core CPU in the form of Qualcomm's IPQ8064. Removing heatsinks and RF can tops shows a pretty clean design. The SFP+ connector is at top left and the QCA9008-SBD1 60 GHz radio module is center bottom. The one RF can that's intact—because its top was soldered on—looks like a Bluetooth radio. Although Bluetooth is not mentioned anywhere in the product documentation, the Bluetooth LE test report among the released FCC ID docs makes it official. The 60 GHz antenna is positioned at the center front of the router as shown in the photo below. 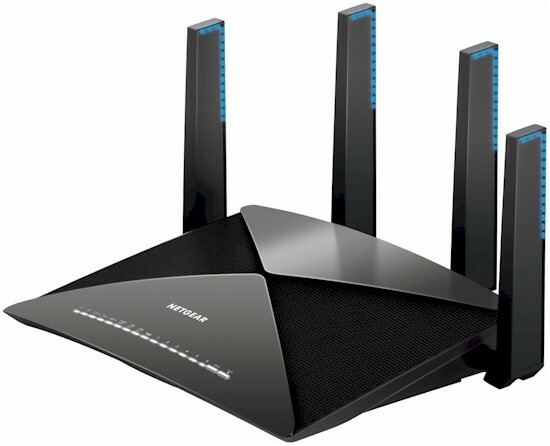 The R9000 joins the R8500 Nighthawk X8 as its second router with active antennas. But this version of the antenna is different, as indicated by the two antenna connections per chain per radio. So I had to open up one of the antennas for a look. The actual antenna element is shown in the top close-up. The middle image is the 2.4 GHz module, which appears to contain only a low noise receive amplifier (LNA). The Skyworks SE2623L 2.4 GHz transmit power amplifier is actually back on the main board. The bottom image is the 5 GHz module, which contains both an unidentifiable (too tiny) LNA and RFMD RFPA5542 5 GHz power amplifier. Both the R9000 and TP-Link Talon AD7200 key parts are summarized in Table 1. Note both use the same 60 GHz QCA radio. The QCA9984 radio differs from the QCA9980 mainly in its 160 MHz bandwidth support. Both are "Wave 2" 802.11ac radio SoCs. The R9000 has three other components not in the table: a (most likely QCA) Bluetooth LE radio; ASM1182e 1x2 PCIe packet switch and ASM1024A 2 port USB 3.0 PCIe controller.